Concert artist, winner of International competitions and Russian-trained teacher in Orange County, CA. Russian born cellist, Feliks Volozhanin, began studying cello at the age of seven. At the age of twelve he became a laureate of Chelyabinsk State Youth Cello Competition and continued his studies at State Institute of Music in Moscow, Russia. Since moving to the United States, Mr. Volozhanin has won first prizes in many contests including the Elizabeth Harper Vaughn, the Rapides Symphony and the SLU Concerto Competitions, studying at Southeastern Louisiana University with Karen Jung. Feliks was a teaching assistant of professor Bongshin Ko at Cal State Fullerton and also served as a principal cellist of Cal State Fullerton Symphony and Cal State Fullerton Cello Choir. Mr. Volozhanin has also studied with esteemed cellists Kirill Rodin, Tchaikovsky Competition Gold Medalist and professor of Moscow State Conservatory. His artistry is based on the deep understanding of musical fabric combined with truly individual approach of each piece. His goal is to deliver the highest quality music to audiences and high standards of instruction to students from all walks of life worldwide . Mr. Volozhanin loves and truly enjoys teaching having over 15 years of experience both in Russia and in the US with outstanding results: 1/3rd of 2017 Irvine Elementary Honor Orchestra cello section were his students. His teaching philosophy is to share what he learned from a great Russian cello school: superb technique and expressive musical interpretation. In my teaching, I focus on developing strong technical foundation, which is crucial to develop at a very early stage for a future success, and nurturing students’ creativity and natural musical talents. As an active concert musican, I understand challenges that students may face in learning cello and how inspiring can be a productive practising! I teach how to practice effectively and get exiting results in a very short time getting students excited by the progress they make. My students successfully compete at International and National competitions and are members of different orchestras including Pacific Symphony Youth Orchestra, All Southern California Elementary Honor, San Juan Capistrano and Irvine Honor Orchestras, and Orange County Youth Symphony. My 11 year old son has been taking lessons at RSM for over a year. He had previously taken lessons with another teacher but progressed very slowly, and I could tell his interest was fading. A few lessons at RSM changed all of that. The lessons were adapted to my son's personality, and my son speaks to his instructor as both a friend as well as a mentor. I am amazed at the progress he has made in a short time. Both my kids have taken cello lessons with Feliks and he is an excellent teacher. He has a true passion for music and teaching. He is a dedicated teacher and my kids love him! I highly recommend him for cello lessons and give him 5 stars! How early can children start taking lessons? Almost every child is ready to take music lessons at 5 years of age. Some children show an interest in music even at a younger age. For these kids I recommend scheduling a consultation to decide whether it is a right time to start. I am delighted to help my students pushing their limits and participating in International, National, and State competions; school and district auditions; local competitions, such as SYMF, Satory, Bach's Festival, MTAC, VOCE and e.t.c. Where in Orange County do you teach? There are no limits set on how often children perform. Performance is an essential and important component of learning and the more students perform, the better. We offer two student recitals per year. Besides playing at the recitals, we encourage and prepare our student to participate in competitions and auditions. 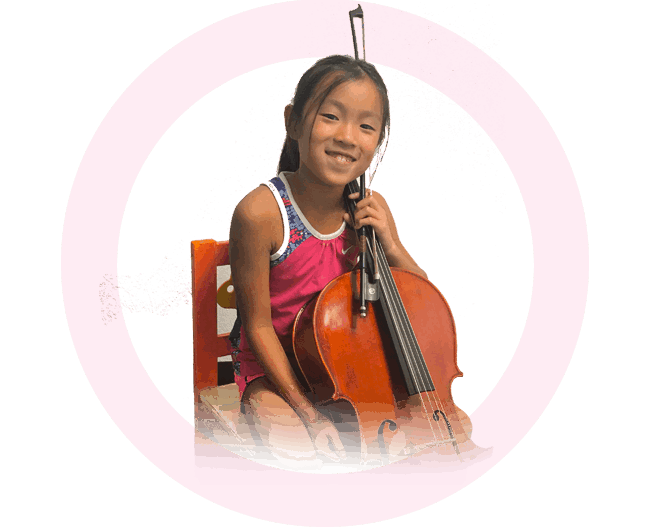 Cello instructions are available for students in Orange County, California, including Aliso Viejo, Anaheim, Anaheim Hills, Brea, Buena Park, Corona del Mar, Costa Mesa, Coto de Caza, Crystal Cove, Cypress, Dana Point, Dove Canyon, El Toro, Foothill Ranch, Fountain Valley, Garden Grove, Huntington Beach, Irvine, La Habra, La Palma, Ladera Ranch, Laguna Beach, Laguna Hills, Laguna Niguel, Laguna Woods, Lake Forest, Los Alamitos, Midway City, Mission Viejo, Modjeska Canyon, Newport Beach, Newport Coast, North Tustin, Orange, Orange Park Acres, Placentia, Portola Hills, Rancho Santa Margarita, Robinson Ranch, Rossmoor, San Clemente, San Joaquin Hills, San Juan Capistrano, Santa Ana, Santiago Canyon, Seal Beach, Silverado Canyon, Stanton, Sunset Beach, Surfside, Talega, Trabuco Canyon, Tustin, Villa Park, Westminster, and Yorba Linda.